I love Jasmine tea and while I’m not a fan of green tea, I do enjoy a high quality green leaf tea or matcha. This new trend to pearls of green tea flavoured with jasmine is something I’ve always wanted to try but never had the chance until recently. 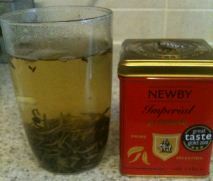 These jasmine pearls won a 3 star gold award at the Great Taste Awards and it is easy to see why. They have a good jasmine flavour without being overpowering. It doesn’t taste synthetic but there are no flowers in the pearls which was a slight disappointment as one of the things I love about ‘traditional Chinese’ jasmine tea is the bits of sticks and flowers in the tea. 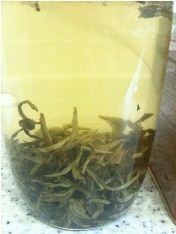 This is much more delicate than the usual jasmine tea and the flavour is delicious. There isn’t an overpowering taste of green tea as the jasmine is the dominant flavour and it is like drinking jasmine flowers infused in green tea so it is a slightly acquired taste but I really enjoyed it. In my large mug I used about one tablespoon of jasmine pearls and it was perfect. I’d suggest trying to remove them before it over brews but it is delightful any way. I had this with a plain 70% dark Askinosie San Jose Del Tambo Ecuadorian chocolate bar and it complimented it beautifully.